Mum blames pumping station for long history of flooding problems. 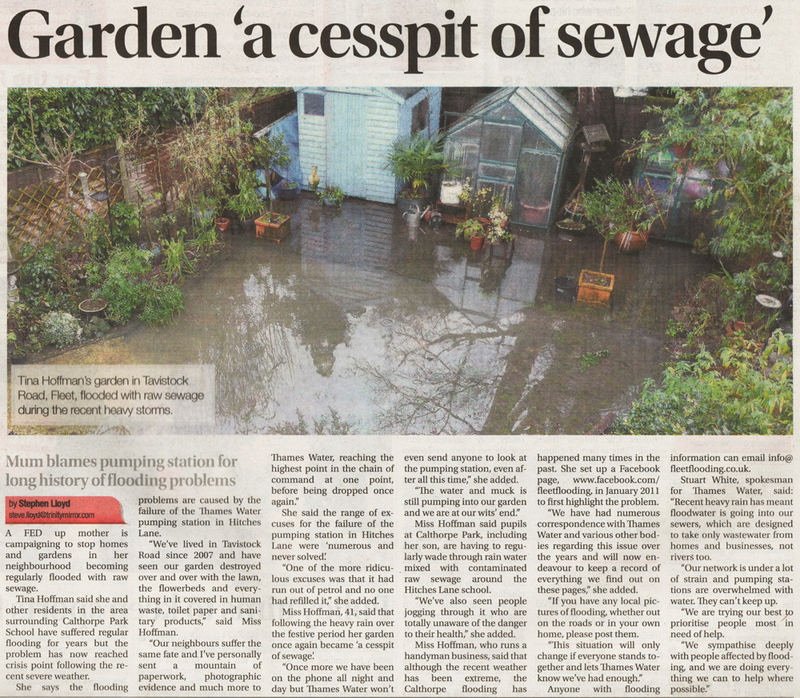 A fed up mother is campaigning to stop homes and gardens in her neighbourhood becoming regularly flooded with raw sewage. Tina Hoffman said she and other residents in the area surrounding Calthorpe Park School have suffered regular flooding for years but the problem has now reached crisis point following the resent severe weather. She says the flooding problems are caused by the failure of the Thames Water pumping station in Hitches Lane. “We’ve lived in Tavistock Road since 2007 and have seen our garden destroyed over and over with the lawn, the flowerbeds and everything covered in human waste, toilet paper and sanitary products”, said Miss Hoffman. “Our neighbours suffer the same fate and I’ve personally sent a mountain of paperwork, photographic evidence and much more to Thames Water, reaching the highest point of command at one point, before being dropped once again”. She said the range of excuses for the failure of the pumping station in Hitches Lane were “numerous and never solved”. “One of the more ridiculous excuses was that it had run out of petrol and no one had refilled it”, she added. Miss Hoffman, 41, said that following the festive period her garden had once again become ‘a cesspit of sewage’. “Once more we have been on the phone all night and day but Thames Water won’t even send anyone to look at the pumping station, even after all this time”, she added. “The water and muck is still pumping into our garden and we are at our wits end”. Miss Hoffman said pupils at Calthorpe Park, including her son, are having to regularly wade through rain water mixed with contaminated raw sewage around the Hitches Lane School. “We’ve also seen people jogging through it who are totally unaware of the danger to their health”, she added. Miss Hoffman, who runs a handyman business, said that although the recent weather has been extreme, the Calthorpe flooding has happened many times in the past. She set up a Facebook page, www.facebook.com/fleetflooding, in January 2011 to first highlight the problem. “We have had numerous correspondence with Thames Water and various other bodies regarding this issue over the years and will now endeavour to keep a record of everything we find out on these pages”, she added. “If you have any local pictures of flooding, whether out on the roads or in your own home, please post them”. “This situation will only change if everyone stands together and lets Thames Water know we’ve had enough”. Anyone with flooding information can email info@fleetflooding.co.uk. “We sympathise deeply with people affected by flooding and we are doing everything we can to help where possible”.